Designed in a compact, versatile 1U two-socket rack server, the Lenovo System x3550 M5 rack server fuels almost any workload from infrastructure to high-performance computing (HPC) to cloud or big data with leadership security, efficiency, and reliability. Integrated with up to two Intel Xeon processors of the E5-2600 v3 product family with faster, energy-efficient TruDDR4 Memory, the x3550 M5 delivers exceptional performance. Storage can include up to 12 drives in an impressive selection of sizes and types. This product guide provides essential pre-sales information to understand the structure of the x3550 M5 offering, its key features and specifications, components and options, and configuration guidelines. This guide is intended for technical specialists, sales specialists, sales engineers, IT architects, and other IT professionals who want to learn more about the x3550 M5 and consider its use in IT solutions. This Product Guide describes withdrawn models of the Lenovo System x3550 M5 (Machine Type 5463) with the Intel Xeon processor E5-2600 v3 product family. For withdrawn models of the Lenovo System x3550 M5 (Machine Type 8869) with the Intel Xeon processor E5-2600 v4 and E5-2600 v3 product families, see the following Product Guide: Lenovo System x3550 M5 (Machine Type 8869). The System x3550 M5 (5463) server models described in this product guide are withdrawn and no longer available for ordering. Suggested use: Database, virtualization and cloud computing, infrastructure security, systems management, enterprise applications, collaboration/email, streaming media, web, and HPC. The following figure shows the System x3550 M5. The x3550 M5 incorporates energy smart features for minimized costs and efficient performance. Dual fan zones support operation in up to 40°C environments. 80 PLUS Titanium power supply units (PSUs) can deliver 96% efficiency at 50% load. The x3550 M5 has outstanding memory performance that is achieved by supporting two-RDIMM-per-channel configurations at speeds up to 12% faster than the Intel specification, while still maintaining world-class reliability. The x3550 M5 integrates leadership security and reliability. System x Trusted Platform Assurance, an exclusive set of System x features and practices, establishes a foolproof security foundation for your workloads. Enterprise-class data protection is provided with optional self-encrypting drives. Diagnostic tools facilitate reduced downtime and costs. The System x3550 M5 is a cost- and density-balanced 1U, 2-socket business-critical server, offering improved performance and pay-as-you grow flexibility along with new features that improve server management capability. New, innovative, energy-smart design with powerful high-performance processors, a large capacity of high-performing DDR4 memory, and an improved feature set are ideal for business-critical applications and cloud deployments. Combining balanced performance and flexibility, the x3550 M5 is a great choice for small and medium businesses and up to the large enterprise. It can provide outstanding uptime to keep business-critical applications and cloud deployments running safely. Ease-of-use and comprehensive systems management tools make it easy to deploy. Outstanding reliability, availability, and serviceability (RAS) and high-efficiency design improve your business environment and help save operational costs. Improves productivity by offering superior system performance with up to 18-core processors, up to 45 MB of L3 cache, and up to 9.6 GT/s QPI interconnect links. Supports up to two processors, 36 cores, and 72 threads to maximize the concurrent execution of multithreaded applications. Intelligent and adaptive system performance with energy efficient Intel Turbo Boost Technology allows CPU cores to run at maximum speeds during peak workloads by temporarily going beyond processor thermal design power (TDP). Intel Hyper-Threading Technology boosts performance for multithreaded applications by enabling simultaneous multithreading within each processor core, up to two threads per core. Intel Virtualization Technology integrates hardware-level virtualization hooks that allow operating system vendors to better utilize the hardware for virtualization workloads. Intel Advanced Vector Extensions 2.0 (AVX 2.0) enable acceleration of enterprise-class workloads, such as databases, enterprise resource planning, and others. Up to 2133 MHz memory speeds with two DIMMs per channel running at 2133 MHz to help maximize system performance. 12 Gbps serial-attached SCSI (SAS) internal storage connectivity doubles the data transfer rate compared to 6 Gb SAS solutions to maximize performance of storage I/O-intensive applications. Flexible and scalable internal storage configurations for up to 46 TB of storage capacity with 3.84 TB 2.5-inch solid-state drives (SSDs) or up to 40 TB with 10 TB 3.5-inch hard disk drives (HDDs) in a dense 1U rack form factor. The use of SSDs instead of or along with traditional spinning HDDs can significantly improve I/O performance. An SSD can support a significantly higher number of I/O operations per second (IOPS) than a typical HDD. The server has four integrated Gigabit Ethernet ports and optional 10 Gb Ethernet ports with mezzanine LOM (ML2) adapters. 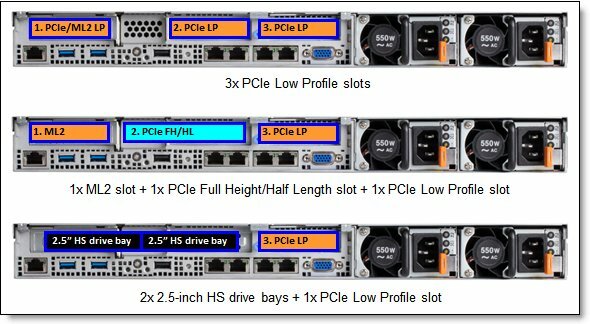 The server offers up to four PCI Express (PCIe) 3.0 I/O expansion slots in a dense 1U rack form factor. With Intel Integrated I/O Technology, the PCI Express 3.0 controller is integrated into the Intel Xeon processor E5 family. This helps to dramatically reduce I/O latency and increase overall system performance. Tool-less cover removal provides easy access to upgrades and serviceable parts, such as processors, memory DIMMs, and adapter cards. The server offers hot-swap drives supporting RAID redundancy for data protection and greater system uptime. The server offers redundant hot-swap power supplies and hot-swap redundant fans to provide availability for business-critical applications. The new next-gen light path diagnostics LCD display panel simplifies servicing, speeds up problem resolution, and helps improve system availability. Proactive Platform Alerts (including PFA and SMART alerts): Processors, voltage regulators, memory, internal storage (SAS/SATA HDDs and SSDs, M.2 storage, flash storage adapters), fans, power supplies, RAID controllers, and server ambient and sub-component temperatures. Alerts can be surfaced through the system IMM to managers such as Lenovo XClarity Administrator, VMware vCenter, and Microsoft System Center. These proactive alerts let you take appropriate actions in advance of possible failure, thereby increasing server uptime and application availability. SSDs offer significantly better reliability than traditional mechanical HDDs for greater uptime. Built-in Integrated Management Module II (IMM2) continuously monitors system parameters, triggers alerts, and performs recovery actions in case of failure, to minimize downtime. Built-in diagnostics using Dynamic Systems Analysis (DSA) Preboot speed up troubleshooting to reduce service time. Three-year customer replaceable unit and onsite limited warranty, next business day 9x5. Optional service upgrades available. The server includes an Integrated Management Module II (IMM2) to monitor server availability and perform remote management. An integrated industry-standard Unified Extensible Firmware Interface (UEFI) enables improved setup, configuration, and updates, and simplifies error handling. XClarity Administrator offers comprehensive hardware management tools that help to increase uptime, reduce costs and improve productivity through advanced server management capabilities. An integrated Trusted Platform Module (TPM) supports the enablement of advanced cryptographic functionality, such as digital signatures and remote attestation. System x Trusted Platform Assurance, an exclusive set of System x security features and practices, establishes a foolproof security foundation for workloads by delivering firmware that is securely built, tested, digitally signed, and verified prior to execution. The server offers enterprise-class data protection with optional self-encrypting drives and simple, centralized key management through IBM Security Key Lifecycle Management. There is industry-standard AES NI support for faster, stronger encryption. Intel Execute Disable Bit functionality can help prevent certain classes of malicious buffer overflow attacks when combined with a supporting operating system. Intel Trusted Execution Technology provides enhanced security through hardware-based resistance to malicious software attacks, allowing an application to run in its own isolated space protected from all other software running on a system. Energy-efficient planar components help lower operational costs. High-efficiency power supplies with 80 PLUS Platinum and Titanium certifications. Intel Intelligent Power Capability powers individual processor elements on and off as needed, to reduce power draw. Low-voltage Intel Xeon processors draw less energy to satisfy the demands of power and thermally constrained data centers and telecommunication environments. Low-voltage 1.2 V DDR4 memory DIMMs offer energy efficiency compared to 1.35 V and 1.5 V DDR3 DIMMs. The server uses hexagonal ventilation holes, a part of Calibrated Vectored Cooling™ technology. Hexagonal holes can be grouped more densely than round holes, providing more efficient airflow through the system. Intel Node Manager provide advanced data center power notification and management to help achieve lower heat output and reduced cooling needs. The following figure shows the front of the server. 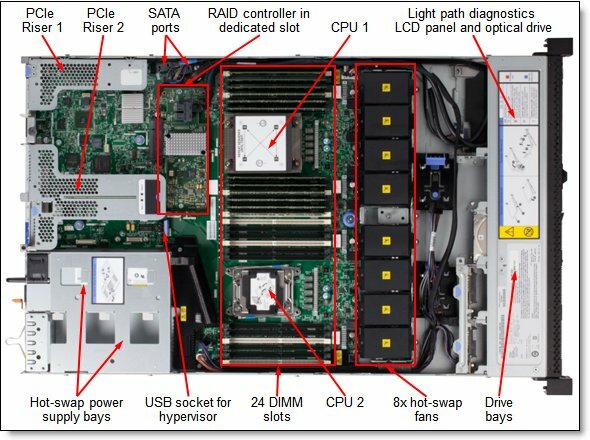 The following figure shows the rear of the x3550 M5 server with three PCIe low profile slots. The following figure shows the locations of key components inside the server. The following table lists the system specifications. Processor Up to two Intel Xeon processor E5-2600 v3 product family CPUs with 18 or 16 cores (2.3 GHz core speeds); or 14, 12, or 10 cores (up to 2.6 GHz core speeds); or 8 cores (up to 3.2 GHz core speeds); or 6 cores (up to 3.4 GHz core speeds); or 4 cores (up to 3.5 GHz core speeds). Two QPI links up to 9.6 GT/s each. Up to 2133 MHz memory speed. Up to 45 MB L3 cache. Memory Up to 24 DIMM sockets (12 DIMMs per processor). RDIMMs and LRDIMMs (Load Reduced DIMMs) are supported. Memory types cannot be intermixed. Memory speed up to 2133 MHz. Memory protection Error correction code (ECC), Chipkill (for x4-based memory DIMMs). Intermix of SAS and SATA drives is supported. 12 Gb SAS/SATA RAID: RAID 0, 1, 10 with M1215 or M5210. Optional upgrade to RAID 5, 50 is available for M1215. Optional upgrade to RAID 5, 50 is available for M5210 (zero-cache; 1 GB non-backed cache; 1 GB, 2 GB, or 4 GB flash-backed cache). Optional upgrade to RAID 6, 60 is available for M5210 with memory cache upgrades. Optional SSD Caching and Performance Accelerator upgrades are available. Optical drive bays One, optional, for models with 4 or 8 drive bays (models with 10 drive bays do not support an internal optical drive). Support for DVD-ROM or Multiburner. 4x Integrated RJ-45 Gigabit Ethernet 1000BASE-T ports (BCM5719). 1x Optional Mezzanine LOM (ML2) slot for dual-port 10 GbE cards with SFP+ or RJ-45 connectors or quad-port GbE cards with RJ-45 connectors. Front: 1x USB 2.0 (8x 2.5" drive bay models) or 2x USB 2.0 l (4x 3.5" and 10x 2.5" drive bay models), 1x USB 3.0, and 1x VGA. Rear: 2x USB 3.0, 1x USB 2.0, and 1x VGA. Optional 1x DB-9 serial port. Internal: 1x USB 3.0 port (for embedded hypervisor). Cooling Calibrated Vectored Cooling with up to eight redundant hot-swap fans (six standard, additional two with the second processor or with the x3550 M5 Thermal Solution Kit); dual fan zones with N+1 fan redundancy; each fan has two motors. Power supply Up to two redundant hot-swap 550 W, 750 W, or 900 W (100-240V), or 1500 W (200-240V) High Efficiency Platinum AC power supplies, or 750 W High Efficiency Titanium AC power supplies, or 900 W High Efficiency -48 V DC power supplies. Hot-swap parts Hard drives, power supplies, and fans. Systems management Unified Extensible Firmware Interface (UEFI), Integrated Management Module II (IMM2.1) based on Renesas SH7758, Predictive Failure Analysis, light path diagnostics, Automatic Server Restart, ToolsCenter, XClarity Administrator, and Intel Node Manager. Optional Advanced Management Module Advanced Upgrade for remote presence (graphics, keyboard and mouse, virtual media). Security features Power-on password, administrator's password, Trusted Platform Module (TPM) 2.0-ready. Optional lockable front bezel. Video Matrox G200eR2 with 16 MB memory integrated into the IMM2. Maximum resolution is 1600x1200 at 75 Hz with 16 M colors. Operating systems Microsoft Windows Server 2008 R2, 2012, 2012 R2, and 2016; Red Hat Enterprise Linux 6 and 7; SUSE Linux Enterprise Server 11 and 12; VMware vSphere (ESXi) 5.1, 5.5, 6.0, and 6.5. Limited warranty Three-year customer-replaceable unit and onsite limited warranty with 9x5/Next Business Day (NBD). Service and support Optional service upgrades are available through the Lenovo Services: 4-hour or 2-hour response time, 8 hours fix time, one-year or two-year warranty extension, remote technical support for System x hardware and selected System x and third-party (Microsoft, Linux, VMware) software. The following table lists the standard models of the x3550 M5. * x in the Model number represents a country-specific letter (for example, the EMEA model number is 5463A2G, and the US Model number is 5463A2U). Ask a Lenovo representative for specifics. ** Titanium power supply; supports 200-240 V AC only. # Processor detail: Processor quantity and model, cores, core speed, L3 cache, memory speed, and TDP. § For these models, the standard DIMM is 8 GB 2Rx8 RDIMM (46W0792). ^ Two I/O slots standard: Onboard PCIe 3.0 x8 slot 0 and low profile PCIe 3.0 x16 slot 1 on the Riser Card 1 (feature code A5AG). Note: Cable Management Arm (CMA) is not included. See the "Rack installation" section for ordering information. The following table lists the Express and TopSeller models of the x3550 M5. # Processor detail: Processor quantity and model, cores, core speed, L3 cache, memory speed, TDP. † Four I/O slots standard: Onboard PCIe 3.0 x8 slot 0, low profile PCIe 3.0 x16 slot 1 on the Riser Card 1 (feature code A5AG), and two low profile PCIe 3.0 x8 slots 2 and 3 on the Riser Card 2 (feature code A5AC). ‡ Four I/O slots standard: Onboard PCIe 3.0 x8 slot 0, low profile PCIe 3.0 x16 slot 1 on the Riser Card 1 (feature code A5AG), and two low profile PCIe 3.0 x16 slots 2 and 3 on the Riser Card 2 (feature code A5AF). The x3550 M5 supports the processor options listed in the following table. The server supports up to two processors. This table shows which server models have each processor standard. If there is no corresponding where used model for a particular processor, this processor is only available through Configure-to-order (CTO). The processor part numbers include a CPU, a heatsink, and two system fans. * The first feature code is for the first processor; the second feature code is for the second processor. System x3550 M5 supports TruDDR4 Memory. TruDDR Memory uses the highest-quality components sourced from Tier 1 DRAM suppliers and only memory that meets our strict requirements is selected. It is compatibility tested and tuned on every System x server to maximize performance and reliability. TruDDR4 Memory will have a unique signature programmed into the DIMM, which will enable System x servers to verify whether the memory installed is qualified/supported. Because TruDDR4 Memory is authenticated, certain extended memory performance features can be enabled to extend performance over industry standards. From a service and support standpoint, System x memory automatically assumes the system's warranty, and service and support provided worldwide. The server supports up to 12 DIMMs when one processor is installed and up to 24 DIMMs when two processors are installed. Each processor has four memory channels, and there are three DIMMs per channel. The server supports RDIMMs and LRDIMMs. Mixing different types of memory (RDIMMs and LRDIMMs) is not supported. The maximum quantity of DIMMs that can be installed in the server depends on the number of processors. Memory speed that is supported by the specific processor. Lowest of maximum operating speeds for selected memory configuration that depends on quantity of DIMMs per channel, as shown under "Maximum operating speed" in Table 5. Chipkill works only in independent channel mode (the default operational mode) and supports only x4-based memory DIMMs. The following table shows the characteristics of the supported DIMMs. Table cells highlighted with a gray background indicate when the number of DIMMs per channel still allows the DIMMs to operate at a rated speed. ** The maximum quantity that is supported is shown for two processors installed. The following table lists memory options available for the x3550 M5 server. * The maximum quantity shown is for one processor / two processors. The following figure shows some of these configurations. Note: Four- and eight-drive bay models of the x3550 M5 support an optional internal optical drive. The following table shows the internal storage options available for the x3550 M5 server. * Available in standard or CTO models, or both. Base drive kits are always factory installed in either standard or custom (CTO) models. Upgrade drive kits can be factory installed or can be installed as a field upgrade for supported standard or custom models. The following table lists possible internal storage configurations. * In the Storage controller column, RAID or HBA means any supported controller for internal storage: M1215, M5210, or N2215. ** Requires the selection of the second processor and a PCIe x16 riser card 2 (feature code A5AF or A5AD); if 145 W processors (E5-2697 v3 and E5-2699 v3) are selected, the ambient temperature cannot exceed 35 °C (95 °F). The HDD Rear Kit (00KA058) is installed in place of the PCIe slots 1 and 2 (see the "I/O expansion options" section), and it includes a special riser that provides PCIe 3.0 x16 slot 3. No other riser cards can be used when the HDD Rear Kit is installed. 145 W and 135 W processors cannot be used when the HDD Rear Kit is installed. The HDD Rear Kit is connected to the SAS expander on the 10-drive backplane. The following table lists the RAID controllers and the additional options used for the internal storage of the x3550 M5 server. The internal storage controllers are installed into a dedicated PCIe slot 4. * Requires cache memory upgrade (47C8656, 47C8660, 47C8664, or 47C8668). ** ServeRAID Feature on Demand upgrades are system-wide. One FoD upgrade part number will enable the feature on all ServeRAID M5200 Series adapters (M5210, M5210e, M5225) installed in the server. The following table summarizes features of supported drive controllers. The following table lists drive types and internal bays supported by the drive controllers. # Rear drives are supported only for 10x 2.5" drive bay models and connected to the SAS expander on the 10-drive backplane. * SEDs are supported with the RAID 5 FoD upgrade (00AE930). ** SEDs are supported with the RAID 5 FoD upgrade (47C8708) or any cache upgrade (47C8656, 47C8660, 47C8664, 47C8668). The following tables list currently available drive options for internal storage of the x3550 M5 server. The x3550 M5 server supports the optical drive options listed in the following table. Server models with ten 2.5-inch drive bays on the front do not support an internal optical drive; a supported external optical drive can be used instead. The locations of the PCIe slots are shown in the following figure. All standard models have one riser card (Riser 1) installed, which provides one low profile PCIe x16 Gen 3 slot (riser option part number 00KA061). You can replace the first riser card or add a second riser card with the riser card options that are listed in the following table (or configure these riser cards to be factory-integrated using special bid or CTO). * Only available via CTO or special bid. The 1 CPU Riser 2 options (feature codes A5AC and A5AE) are supported only in configurations with one processor. If two processors are selected, these options cannot be used. If the FHHL x16 Riser 2 option (feature code A5AD) is selected, the x16 Riser 1 option (feature code A5AG) cannot be used. The HDD Rear Kit (00KA058; see the "Internal storage" section) is installed in place of the PCIe slots 1 and 2, and it includes a special riser that provides PCIe 3.0 x16 slot 3. No other riser cards can be used when the HDD Rear Kit is installed. The x3550 M5 Thermal Kit is not needed if two processors are installed, because the second processor includes these fans. The COM Port Bracket, part number 00KA161, is used for mounting the external serial port on the rear of the x3550 M5. This option includes the bracket and the cable. The COM Port option is mounted in place of the PCIe slot 3, and only PCIe slots 1 and 2 remain available. The following table lists the x3550 M5 Thermal Kit and COM Port Bracket part numbers. The x3550 M5 supports four integrated Gigabit Ethernet ports. Optionally, the x3550 M5 server supports ML2 adapters that are installed in the custom ML2 slot provided by the PCIe ML2 riser card (part number 00KA063). This slot supports adapters with either two 10 Gb ports or four Gigabit ports and supports direct connectivity to the IMM2.1 service processor for out-of-band systems management. The following table lists additional supported network adapters. ^ Transceivers and DAC cables are available only from Mellanox or as a part of a Lenovo Intelligent Cluster solution. † Supported only in the PCIe 3.0 x16 slots (PCIe x16 riser cards 00KA061, 00KA066, and feature A5AD). * SFP+ and QSFP+ based adapters require supported transceivers or DAC cables that must be purchased for the adapter (See "40 Gb QSFP+ transceivers and DAC cables" and "10 Gb SFP+ transceivers and DAC cables" in the table above). # Transceivers and DAC cables are available only from Mellanox. ** The maximum number of transceivers or cables that are supported per adapter equals the quantity of the adapter ports. All adapter ports must have the same type of transceiver or DAC cable selected. The following table lists SAS RAID controllers and HBAs for external storage attachments that are supported by the x3550 M5 server. * One FoD upgrade for the M5225 activates the feature on all M5200 series controllers installed in a server. ** Requires the second processor and the FHHL x16 Riser Card 2 (feature code A5AD). The following table summarizes features of supported RAID controllers and HBAs. The following table lists Fibre Channel HBAs supported by the x3550 M5 server. Product availability: The Flash storage adapters that are supported by the System x3550 M5 server are withdrawn and no longer available for ordering. The x3550 M5 server supports the Flash storage adapters listed in the following table. * Requires the FHHL x16 Riser Card 2 (feature code A5AD) and the second processor. If only one processor is installed in the server, then the x3550 M5 Thermal Kit, part number 00KA059, is required for the installation of the PCIe Flash adapters listed in the above table. Low profile Flash Adapters are supported in low profile and half-high slots; full-high Flash Adapters are supported only in the PCIe slot 2 and require the FHHL x16 Riser Card 2 (feature code A5AD) and the second processor. The io3 Flash Adapters listed in the above table cannot be factory installed; they are supported as field-installable options only. The server cannot be shipped with these adapters installed. The x3550 M5 server supports graphics processing units (GPUs) listed in the following table. * Available only through CTO or special bid. The NVIDIA Quadro adapters are full-high adapters that are supported only in the PCIe slot 2. The PCIe Riser 2, 1-2 CPU (FHHL x16 CPU1 + LP x16 CPU0) (feature code A5AD) is required. The second processor is required. The maximum memory that can be installed is 1 TB. Further restrictions may apply depending on the power supplies installed (see "Power supplies"). The x3550 M5 server supports up to two redundant power supplies, and is capable of N+N redundancy depending on the configuration. Standard models come with one power supply. The following table lists the power supplies. A hot-swap power supply option ships standard with one 2.8m, 10A/100-250V, IEC 320-C13 to IEC 320-C14 rack power cable. Other country-specific and rack cables can be ordered if needed (see the following table). The server supports VMware ESXi installed on a USB memory key or one or two SD cards in the SD Media Adapter for System x. The USB memory key is installed in a USB socket inside the server. The SD Media Adapter is installed in a dedicated slot inside the server. When only one SD card is installed in the SD Media Adapter, you can create up to 16 volumes, each of which is presented to UEFI as a bootable device. When two SD Media cards are inserted, volumes can be mirrored (RAID 1) across both cards, up to a total of eight mirrored volumes. The use of mirrored volumes improves system availability because the server remains operational, even if one SD card fails. The RAID functionality is handled internally by the SD Media Adapter. The following table lists virtualization options. * Option 00ML706 includes two 32GB SD cards; however, for CTO orders, feature code A5TJ does not include SD media and the 32 GB cards and VMware vSphere preload must be selected separately. The server contains Integrated Management Module II (IMM2.1), which provides advanced service-processor control, monitoring, and an alerting function. If an environmental condition exceeds a threshold or if a system component fails, the IMM lights LEDs to help you diagnose the problem, records the error in the event log, and alerts you to the problem. Optionally, the IMM also provides a virtual presence capability for remote server management capabilities. The blue-screen capture feature captures the video display contents before the IMM restarts the server when the IMM detects an operating system hang condition. A system administrator can use the blue-screen capture to assist in determining the cause of the hang condition. The following table lists the remote management option. All models come standard with basic light path diagnostics, which include the system LEDs on the front of the server (See Figure 2) and the LEDs near the monitored components (for example, the DIMM error LED on the system board). Models with 4x or 8x 2.5-inch drive bays support a next-gen light path LCD display panel. The LCD display enables you to have quick access to system status, firmware, network, and health information. Models with 4x 3.5-inch or 10x 2.5-inch front drive bays do not support an LCD display panel. The following table shows the LCD display panel ordering information. The ToolsCenter Suite tool is a consolidation of server management tools that helps simplify the management of System x servers. It provides functions to collect full system health information (including health status), configure system setting, update system firmware and drivers, and FoD mass activation key management for multiple endpoints. The ServerGuide tool simplifies the process of configuring RAID and installing supported Microsoft Windows Server operating systems and device drivers on a System x server. The UpdateXpress System Packs (UXSPs) are integration-tested bundles that enable you to maintain your server firmware and device drivers up-to-date and help you avoid unnecessary server outages. The Dynamic System Analysis (DSA) pre-boot or standalone diagnostics software speeds up troubleshooting tasks to reduce service time. Lenovo XClarity is a centralized systems management solution that helps administrators deliver infrastructure faster. This solution integrates easily with Lenovo x86 servers, Flex System, and RackSwitch switches, providing automated agent-less discovery, monitoring, firmware updates, configuration management, and bare metal deployment of operating systems and hypervisors across multiple systems. Lenovo XClarity Administrator is an optional software component for the System x3550 M5 which can be downloaded and used at no charge to discover and monitor the x3550 M5 and manage firmware upgrades for them. If software support is required for Lenovo XClarity Administrator, or Lenovo XClarity Administrator premium features (such as configuration management and operating system deployment) are required, or both, Lenovo XClarity Pro software subscription should be ordered. Lenovo XClarity Pro is licensed on a per managed system basis, that is, each managed Lenovo system requires a license. The following table lists the geo-specific Lenovo XClarity software license options. Lenovo XClarity Energy Manager provides a stand-alone, web-based agent-less power management console that provides real time data and enables you to observe, plan and manage power and cooling for Lenovo System x and ThinkServer x86 servers. Using built-in intelligence, it identifies server power consumption trends and ideal power settings and performs cooling analysis so that you can define and optimize power-saving policies. Lenovo XClarity Energy Manager is an optional software component for the System x3550 M5 that is licensed on a per managed node basis, that is, each managed server requires a license. The following table lists the geo-specific Lenovo XClarity Energy Manager software license options. The following table lists the rack installation options that are available for the x3550 M5 server. Note: The System x3550 M5 Slide Kit G4, part number 00KA606, is included with the standard models that are listed in Table 2 and Express and TopSeller models that are listed in Table 3. * The rack must be at least 1100 mm (43.31 in.) deep if no CMA is used, or at least 1200 mm (47.24 in.) deep if a CMA is used. ** The rack must be at least 1000 mm (39.37 in.) deep. *** Measured when mounted on the rack, from the front surface of the front mounting flange to the rear most point of the rail. For the latest information about the specific versions and service levels that are supported and any other prerequisites, see the Operating System Interoperability Guide: http://lenovopress.com/redposig. Server on: 5 °C to 40 °C (41 °F to 104 °F); altitude: 0 to 950 m (3,117 ft); decrease the maximum system temperature by 1 °C for every 175-m increase in altitude above 950 m.
Supports cloud-like workload with no performance degradation acceptable (Turbo-Off). Under no circumstance can any combination of worst case workload and configuration result in system shutdown or design exposure at 40 °C. The System x3550 M5 has a three-year customer-replaceable unit (CRU) and onsite (for field-replaceable units [FRUs] only) limited warranty with standard call center support during normal business hours and 9x5 Next Business Day Parts Delivered. Lenovo’s YourDrive YourData service is a multi-drive retention offering that ensures your data is always under your control, regardless of the number of drives that are installed in your Lenovo server. In the unlikely event of a drive failure, you retain possession of your drive while Lenovo replaces the failed drive part. Your data stays safely on your premises, in your hands. The YourDrive YourData service can be purchased in convenient bundles with Foundation, Essential, or Advanced Service upgrades and extensions. Lenovo Enterprise Server Software Support can help you troubleshoot your entire server software stack. Choose support for server operating systems from Microsoft, Red Hat, SUSE, and VMware; Microsoft server applications; or both operating systems and applications. Support staff can help answer troubleshooting and diagnostic questions, address product compatibility and interoperability issues, isolate causes of problems, report defects to software vendors, and more. Keeping microcode current helps prevent hardware failures and security exposure. There are two levels of service: analysis of the installed base and analysis and update where required. Offerings vary by country and can be bundled with other warranty upgrades and extensions. The following tables list the SAS external drive enclosures that are offered by Lenovo that can be used with the System x3550 M5 for storage expansion. The following table lists the external storage systems that are currently offered by Lenovo that can be used with the System x3550 M5 in IT solutions. The following table lists the external backup options that are offered by Lenovo that can be used with the System x3550 M5 in backup solutions. The following table lists the Ethernet LAN switches that are offered by Lenovo that can be used with the System x3550 M5 server in IT solutions. The following table lists currently available Fibre Channel SAN switches that are offered by Lenovo that can be used with the System x3550 M5 in IT solutions. The following table lists the rack cabinets that are offered by Lenovo that can be used in System x3550 M5 solutions. The following table lists the KVM switches and consoles that are offered by Lenovo that can be used in System x3550 M5 solutions. The following table lists the power distribution units (PDUs) that are offered by Lenovo that can be used in System x3550 M5 solutions. The following table lists the uninterruptible power supply (UPS) units that are offered by Lenovo that can be used in System x3550 M5 solutions. Microsoft®, PowerShell, Windows PowerShell®, Windows Server®, and Windows® are trademarks of Microsoft Corporation in the United States, other countries, or both.